You can return to our flowering shrubs page or browse the pictures using the next and previous links. If you've found inspiration take a look at the shrubs section in our garden centre. but this is one you can really fall in love with! Yes, I think so too! Ta! I planted three new ones last year - only one has flowers and they're not large. Maybe it's the lack of rain here - I simply can't water the whole garden as much as it needs. We use the stream and a pump - it's allowed, we don't take nearly as much as the legal limit. What a great idrea, taking water from the stream...btw, I haven't forgotten about the gunnera magellanica. I shall be digging it out later on. I think its lovely aswell. 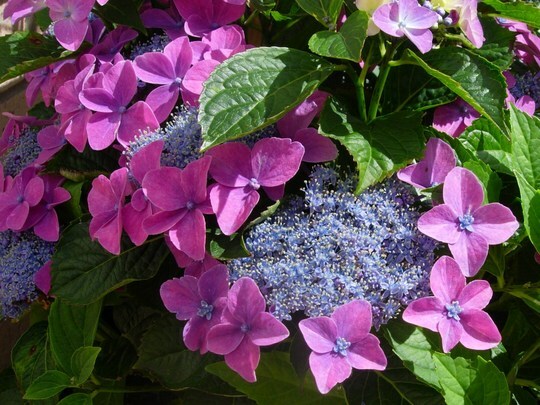 Hydrangeas are growing on me now! Love this one. And your garden looks lovely. Good luck with the pond!!!!! Oh , thanks a lot Lulu! Had a debate with OH today about position of pond, but I seem to have come out on top......so far....he's not all that keen on the idea and to be fair the last pond we had was terrible for pondweed, and that was with one of those fancy UV filtrations systems...I don't think it made a blind bit of difference! Keep them small and shaded helps alot!! Erm...yes...I need to reconsider the site for the pond! !